Authorities arrested a Department of Homeland Security employee in Pennsylvania Friday for charges related to walking into his agency's Washington, D.C., headquarters with a gun, a knife, an infrared camera, pepper spray and handcuffs in June, the Associated Press reported. Federal government analyst Jonathan Leigh Wienke, 45, is charged with illegally building a silencer on an unregistered pistol and having materials to build more silencers, according to the seven-count grand jury indictment unsealed Friday in U.S. District Court in Martinsburg, West Virginia. The charges carry up to a 10-year prison term. 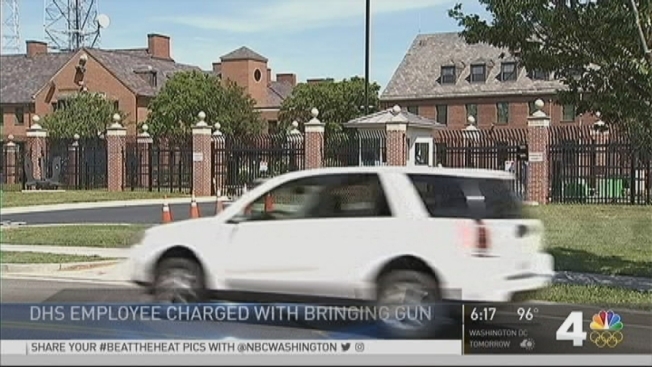 Wienke was found with the gun by security officers while he was on the job at agency headquarters on Nebraska Avenue in northwest D.C., according to court filings obtained by the News4 I-Team. A federal agent and security officers also found Wienke had a knife, pepper spray, thermal imaging equipment and radio devices, according to a request for court permission to raid Wienke’s Martinsburg home. Ashley Lough, a spokeswoman with the U.S. attorney's office in northern West Virginia, said the arrest Friday was related to a search warrant last month on Wienke's house, about a 75-mile commute to the Washington office, the AP reported. Though the newly filed federal criminal charges do not specify if evidence was seized during a raid of Wienke’s home, the court filings said Wienke possessed multiple illegal firearms. The court filings from prosecutors said the firearms do not display serial numbers or manufacturing markings. Prosecutors said Wienke was also found with “cylindrical” devices capable of silencing the firing of a gun. The federal charges do not reference Wienke’s arrest at DHS headquarters. D.C. prosecutors said they are awaiting the decision of a grand jury before further action is taken in that case. Wienke has pleaded not guilty in the D.C. case. The feds said in the court filing that Wienke was found in his workspace, which is in close proximity to a meeting of senior agency officials the day of his arrest, and that Wienke was aware of the meeting. But this month, the department's chief security officer, Richard McComb, told a House homeland security subcommittee that there is "no indication" Wienke was "planning or conspiring to commit workplace violence." According to the court filing, Wienke was chosen for a random security screening when he arrived at agency headquarters about 7:30 a.m. June 9. The feds, in their filing, said security officers found the knife, pepper spray, thermal imaging equipment and radio devices during the screening and seized them. But he was allowed to proceed to his office by agency security, according to their court filing. Initially he was charged with carrying a pistol without a license. He was placed on administrative leave from his job after his initial arrest, and a judge barred him from entering DHS headquarters while the investigation continues. Wienke is due for a court appearance before a U.S. Magistrate judge in Martinsburg Wednesday. On July 11, another DHS employee was caught with a gun at headquarters. Thomas Pressley, a contractor who works in IT for the agency, pleaded not guilty.